At the time of New Aadhaar Card Enrollment to Aadhar card EID number(Enrollment number ) will be issued to the applicant. This is used as the further reference in order to avail Aadhar card. If in case you lost or forgot your Enrollment number you can get it from many ways here we provided. Aadhar card is used as proof of address hence this is the most important document if in case you lost or forgot your Aadhar card number nothing to worry. Aadhar holders now have a facility to retrieve your Aadhar card number from UIDAI (Unique Identification Authority of India) official website. 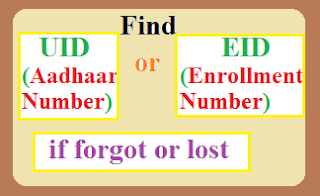 Along with the prior information to get lost or forgot Aadhar card number or enrollment number you will find complete process here to fetch details. If you forgot or want to know the Aadhaar card number or Enrollment id number, don’t worry for that Now we have a chance to know these numbers by following methods. Find your nearest aadhar card enrolment center and visit to get aadhar number and enrolment number or if you want any details regarding aadhar they can give you maximum data. 2. We may have a chance to know by calling to 1947 it is the UIDAI Official Customer Care Number. What details we Required to get UID or EID number / aadhar card or enrollment Id number forgot or lost. If your mobile number or Email Id is not registered to your aadhar card at the time of enrollment or registered but loss that one then first to do "link mobile number with aadhar card"
After above step completed you will get a one-time password to your registered mobile number or email id whatever you have given in the above step. Now you will get the Aadhar Number or Enrolment Number to your registered mobile number or Email id whatever you are given information. i lost my aadhaar card and there is no registration of mobile n email than how to find aadhaar card number please suggest me. My uncle forgotted aadhar, with eid & uid. And his linked number mobile is gone.his not linked with email. How is he got him aadhar...? I lost my adhar card and enrollment number also......can u please help me out finding the number..
even after otp verification the enrollment number was not sent on the registered mobile no. what should i do?